Spring is here. This means it is a perfect time to start researching and planning what you want to grow this year. I am already dreaming about sunflowers, lavender, fresh tomatoes, and a variety of other produce and herbs. I love to garden, and have always been spoiled with the gift of family with very green thumbs. I adore fresh flowers, herbs, fruits, and vegetables and am glad to grow or have access to a wonderful supply each year. 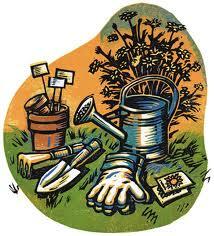 During the garden planning and planting process do not forget that everyone can take part in gardening. No matter the age, we can all dig a hole to plant a seed or young plant, pick out a plant to grow, or help chose a container to plant in. A wonderful trick to getting children (or adults) to try new foods is to have them help grow, pick, and help wash and prepare them. The library has a vast gardening section in the adult nonfiction section to help with the important planning and plant choices. However, do not overlook the books in the children’s room. These books can give gardeners of all ages some ideas and inspiration to garden as a family, or to give the kids their own special little container or garden space. Here are a few of the great gardening books about involving children and getting them excited in the process. For most gardeners, there is no better season than spring. After a long winter, we forget about previous garden disasters (like those darn deer that ate their way through last summer’s flower beds…) and look forward to what will surely be our most fabulous garden ever! As I do every year, I spent part of last winter looking through gardening books and catalogs and planning improvements to my home landscape. One of the many wonderful aspects of working at a library is easy access to all of the best books on any subject, including lots of garden and landscape books. Here are some of my favorites from the last couple of years. Coffee for roses : …and 70 other misleading myths about backyard gardening Garden “myth-busting” done with wit and style. Save yourself time and money–one of the tips I picked up from this book will save me both. The Know Maintenance Perennial Garden This simplified approach to perennial gardening uses hardy, attractive plants grown on a 10×14 foot grid. Each of the 62 garden plans combines complementary plants that thrive together and grow as a community and are designed for easy maintenance, the goal of most home gardeners. Even if you don’t switch to this system, you will find some good ideas. Landscaping Ideas That Work. Your yard should be an extension of your home and this terrific book covers front, back, and side yards and provides strategies for combining elements and creating spaces that work with any home. Some great before and after photos. Lawn gone! : low-maintenance, sustainable, attractive alternatives for your yard. My husband and I have ongoing “discussions” about our too-large lawn. Every year I drag books like this home in hopes that he will give up the turf war. No luck yet, but I keep hoping! The Shady Lady’s Guide to Northeast Shade Gardening. This is a great book for those of us whose yards are graced with large shade trees. The Shady Lady identifies best practices, best plants, and best information, specifically designed for the zones of the greater Northeast – and leaves out all the rest. Includes a large yet highly selective illustrated plant gallery that includes all the indispensable perennials, ferns, and bulbs. Don’t forget magazines! We get many home and garden magazines in paper and downloadable formats, including Better Homes and Gardens, Fine Gardening, Organic Gardening and more. This year, in addition to my own gardens and a period herb garden I help maintain at the Thankful Arnold House Museum in Haddam, I am assisting with a garden project here at the Cheshire Public Library. Cheshire Garden club member Anupa Simpatico has designed a low-maintenance garden with four-season appeal for the front of the library. This project supports and promotes a healthy environment for birds and pollinating insects and carries out the Cheshire Garden Club’s mission of garden education, civic beautification and the preservation of wildlife. Click here to see the plan and plant list. This project wouldn’t be possible without the support of the Friends of the Library, who are helping fund it with money donated in memory of Margaret Andersen, a long-time member of the Friends and an avid gardener. The Cheshire Town Beautification Committee and several anonymous donors have made generous contributions towards the cost of the plants and shrubs. The garden will be enjoyed by library visitors as well as countless people who pass by the front of the library in vehicles and on foot. We are looking for volunteers to help plant and maintain the garden. Please contact me at drutter@cheshirelibrary.org if you are interested in helping. Spring Has Sprung! Thinking About Gardening? 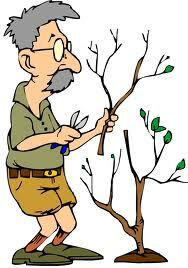 If you enjoy working in your yard, one of the first things to do in Spring is pruning. But it can be confusing just which plants should be pruned at what time of year. The books listed below can help you make the right choices. Now is the time to also start planning your garden. The Cheshire Library has a whole shelving section downstairs in the Reference Department just for Gardening Books. For those of you who may be new to gardening, here is a selection of titles that will help you get started. Additional titles can be found in the 635 area of Reference.